Above: File photo of a Silent Falcon drone poised for launch. Image credit: Silent Falcon UAS Technologies. The Department of the Interior continues to aggressively move toward the use of drones to provide information for land managers. The agency is purchasing dozens of them and recently issued Call When Needed (CWN) contracts for contractor operated and maintained drones to be used on fires. On July 11 the Bureau of Land Management activated one of the new CWN drones to map the HUGE Martin Fire that has burned 435,000 acres in Northern Nevada. 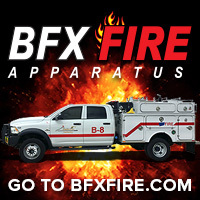 The company that got the call was Bridger Aerospace, an outfit that also had nine Aero Commanders under contract for Type 1 Air Attack services, used as a platform for coordinating airborne firefighting aircraft. Drones, for Bridger, is a new field, and they have partnered with Silent Falcon UAS Technologies for the use of their Silent Falcon drone. July 7 was a big day on the Martin Fire. During its first day on the fire, today, July 13, it has conducted four sorties for a total of 5.6 hours, according to Gill Dustin, the Unmanned Aerial Systems Manager for the BLM. The aircraft is being used to map unburned islands inside the perimeter, look for remaining heat on the fire and outside the fireline, and identify structures and other infrastructure to determine if they have been damaged or not. The company brought four aircraft to the fire, but so far are only using one at a time. Infrared photo taken by Silent Falcon UAS with Ascent Vision CM-100 Gimbal. Credit: Bridger Aerospace. Screen capture with incident map on the left. Camera keystone (field of view) is the red cone on the right side of the aircraft. Credit (Bridger Aerospace). Camera view is on the right. The BLM has secured from the FAA an Emergency Course of Action (ECOA) to enable the aircraft to operate within the Temporary Flight Restriction. Kurt Friedemann, Vice President of Bridger Aerospace, said that on the Martin Fire it has been flying at 8,000 feet, which in that area is about 3,000 feet above the ground. The Silent Falcon is powered by an electric motor drawing its power from a battery. But there are also solar panels on the wings which can add a small amount of additional power to the battery while in flight. With the fuselage made of carbon fiber, it is quite light and energy efficient. Mr. Friedemann said that occasionally the aircraft can take advantage of thermals, like a glider, to extend the amount of time it can loiter over a target. Normally they expect to get at least 5 hours of flight time out of the aircraft. It is launched on a spring-loaded catapult, and has no landing gear. It lands via parachute — upside down to protect the payload. The entire system can be transported in a pickup truck. The payload can be changed to meet the needs of the end user, but for this mission it has electro-optical and infrared sensors. On the Martin fire, which is almost 60 miles long east to west, the Silent Falcon is operating out of line of sight, which puts it into a different certification category than your typical consumer drone. To integrate the drone into the management of the incident there are two critical positions that are filled by the incident — an Unmanned Aerial Systems (UAS) Manager and a Data Specialist. The manager helps to integrate the system into the Incident Management Team structure. A drone, especially while live-streaming video, can generate a crap-ton of data. Managing that can be problematic if it’s not figured out in advance and carefully curated as it is collected. Mr. Friedemann said that just 10 days ago they completed 7 days of training for personnel and carding for the aircraft in West Wendover, Nevada. And now they have their flight crew spiked out miles from the Incident Command Post in one of the most sparsely populated areas of the United States. According to the National Situation Report there are only 634 personnel assigned. That is extremely low density of firefighters for such a huge fire — it stretches for 56 miles, west to east. Let’s assume for a moment that the perimeter is 150 miles (it is probably more). If so, that is about three people per mile of fireline, not including support personnel. However with mostly light fuels, there is less mop up after the spread is stopped, requiring fewer personnel. The perimeter of the Martin Fire at 8:49 p.m. MDT July 10, 2018. The yellow line was from the previous day. With the long distances, limited numbers of firefighters, and what may be difficult access, firefighters on the Martin Fire say they have developed an innovative approach to containing the blaze. 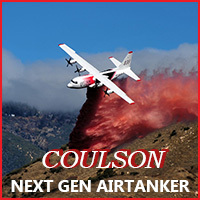 Firefighters know that air tankers and helicopters dropping water or retardant do not put out fires. Under ideal conditions they can slow them down enough to allow ground-based firefighters the opportunity to move in and actually put out the fire in that area. If there is no ground support working with the aircraft, the chances of success are very low. Reading between the lines of an update about the fire (embedded farther down) it appears that firefighters realized that in some instances the fire was spreading beyond retardant drops. It is not clear if the fire burned through the retardant, spotted over, or burned around the retardant. 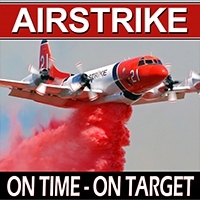 Photo uploaded to InciWeb July 8, titled: “Martin Fire Crossing Retardant Lines”. The tactic they decided to deploy involved using a combination of water-scooping air tankers, retardant-dropping air tankers, and firefighters building line on the ground. 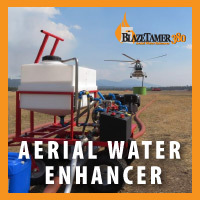 Aircraft that drop water, helicopters or fixed wing, apply it directly to the flaming front, since dropping it out ahead of the fire is often not effective since it does not adhere to the vegetation or have a long-term effect like retardant. Crews and equipment are making excellent progress building containment lines along the southeast flank of the fire. 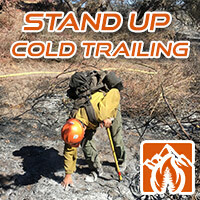 Due to the heavy, fine fuel loads, high winds and extremely fast fire rates of spread, an innovative tactic has been developed to combat these conditions using a three-prong attack. First, a long line of water is laid down by super scoopers, immediately followed by a retardant drop from air tankers. The approaching fire is thus cooled sufficiently that dozers and crews can safely and immediately dig a containment line right up against the side of the retardant line facing away from the flame front. Very close timing and coordination of air drops of water and retardant with ground forces has been proven to be the most effective tactic in these volatile burning conditions. The part that may be innovative is slowing the flaming front with scooping air tankers AND then putting retardant just outside the edge of the fire. And as usual, quick followup by ground forces is essential. 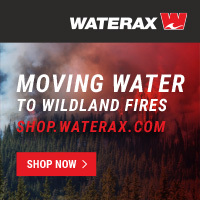 Here are links to videos shot on the Martin Fire of drops by a DC-10 and two water scoopers. 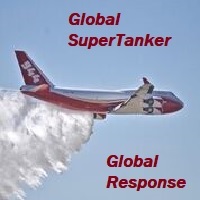 Is it interesting that these firefighters, like many others in Canada and Europe, know that water-scooping air tankers are a very important tool in the toolbox. However, this year the U.S. Forest Service decided not to have any of them on exclusive use contract. The ones being used thankfully were available on a Call When Needed contract. And the number of retardant-dropping large air tankers on EU contracts were cut by one-third over last year. Yesterday, fire spread slowed significantly due to the hard work of the local Elko Task Force that hit the head of the fire early Sunday morning and throughout the day. The task force took advantage of the fire naturally slowing as it entered flatter terrain with lesser fuel loads. Operations personnel report that the fire is moving into patches of greener vegetation such as Siberian wheat grass, which was planted as part of the BLM’s rehabilitation and fuel treatment efforts on previous fires. Green fuels slow the fire’s advance, making it easier for bulldozers and engines, with the aggressive assistance of super scooper air tankers and heavy and light helicopters, to catch up and get containment lines in place. The head of the fire on the east side has approached and so far has not crossed the major drainage in the 3-D map below, thanks, no doubt, to the points brought out in the preceding quote. A 3-D map showing the perimeter on the east side of the Martin Fire at 8:49 p.m. MDT July 10, 2018. The yellow line was from the previous day. The Martin Fire is bringing in Beth Lund’s Type 1 Great Basin Management Team to handle the east side, while Taiga Rohrer’s Type 2 Great Basin Incident Management Team will continue to take care of the west side. Thanks to COL Paul Murray @99ABWCC and the team from @NellisAFB for hosting @lakemeadnps and the @NatlParkService at #AviationNation. The “N” number on the aircraft is clever. Airmen of the North Carolina Air National Guard load the Modular Airborne FireFighting System into a C-130 belonging to the Nevada Air National Guard. Photo September 7, 2016 by 1st Lt Monica Ebert. Earlier this month in Charlotte the 145th Airlift Wing of the North Carolina Air National Guard finalized the transfer of their Modular Airborne FireFighting System (MAFFS) mission to the Nevada Air National Guard’s 152nd Airlift Wing. On September 7 the equipment was loaded into a C-130 from Nevada Air National Guard and arrived at Reno the next day. The previous week the Nevada Airlift Wing had completed its first training activation operating the U.S. Forest Service’s MAFFS. The other MAFFS units are at Cheyenne, Colorado Springs, and Channel Islands in California. Airmen of the North Carolina Air National Guard load the door to the Modular Airborne FireFighting System into a C-130 belonging to the Nevada Air National Guard. Photo September 7, 2016 by 1st Lt Monica Ebert. The USFS has 8 MAFFS units that can be slipped into a C-130 in just a few hours, converting it to a 3,000-gallon air tanker. Usually two of the units are at each of the four bases, but one is now being temporarily used in an HC-130H that was transferred from the Coast Guard to the USFS. The first 152nd C-130 equipped with U.S. Forest Service’s Modular Airborne Fire Fighting System arrived September 8, 2016, at the Nevada Air National Guard Base in Reno. The unit completed its first fire fighting mission as co-pilots augmented with the Air Expeditionary Group the previous week. The 152nd was selected to become the new MAFFS unit in April. Above: The first 152nd C-130 equipped with a U.S. Forest Service Modular Airborne FireFighting System arrived Thursday, Sept. 8, 2016, at the Nevada Air National Guard Base in Reno. The unit completed its first fire fighting mission as co-pilots augmented with the Air Expeditionary Group the previous week. The 152nd was selected to become the new MAFFS unit in April. Photo by Tech. Sgt. Emerson Marcus September 8, 2016. The Air National Guard unit at Reno completed its first training activation operating the U.S. Forest Service’s Modular Airborne FireFighting System last week and the first of the unit’s C-130s equipped for MAFFS arrived at the base Thursday, September 8. In April the Reno 152nd Airlift Wing became one of the four bases designated to operate MAFFS units. They are replacing the 145th Airlift Wing of North Carolina that is transitioning from the C-130 to the C-17. The other MAFFS bases are at Cheyenne, Colorado Springs, and Channel Islands in California. In recent weeks, 12 aircrew of the 152nd activated as part of the Air Expeditionary Group fighting wildland fires in Idaho, Nevada and Oregon. The AEG – made up of military C-130 units operating MAFFS – flew 142 sorties, 125.5 flight hours, dispensing more than 3.5 million pounds of retardant on 165 drops during the month-long activation that began in early August. This fire season effectively started the 152nd’s co-pilot certification clock. Co-pilot certification could be completed prior to the 2018 fire season when the unit would enter certification as aircrew commanders. Once the aircrew commander certification is complete, they then begin certification as flight instructors and could begin autonomous fire fighting missions. This year the annual fire suppression training for California and Nevada Air and Army National Guard helicopter crews was held April 15-17, 2016 near Sutter Creek, California. 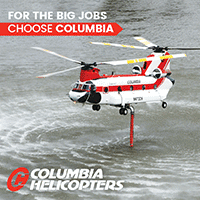 Chinook, Blackhawk, and Lakota helicopters participated in a mock fire incident using Pardee Lake as a water source. The Guard is only activated when private sector helicopter operators cannot fill the incident commander’s resource orders for a particular type or mission specific helicopter. Usually the requests are for a Type 1 helicopter, a Blackhawk or Chinook, that cannot be supplied by the private sector in a reasonable period of time. The Lakota helicopter is used as a helicopter coordinator platform and for medical evacuation missions. 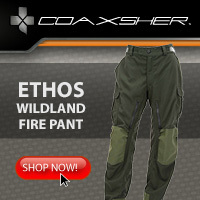 If requested by the incident commander the Lakota can be dispatched with military medics. During the last five decades the Guard assisted on fires in almost every fire season. The policy of teaming a Guard helicopter with a CAL FIRE military helicopter manager serving as a flight crew member has been a successful program for twenty years. 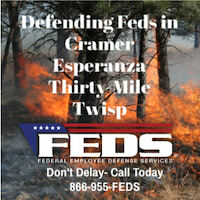 The military manager not only provides tactical fire direction including initial attack on new fires but arranges for complete logistical support. The manager works closely with a military liaison to make sure the program flows smoothly. These photos were taken by Bob Martinez, a Volunteer in Prevention Photographer for CAL FIRE. You can see more of his work at his web site.